Expand "Statistics" section in left navigation bar and click on "Search" link. By default, the Summary screen is displayed which contains statistics like successful searches, failed searches, recent successful search etc. in tabular and pictorial form. 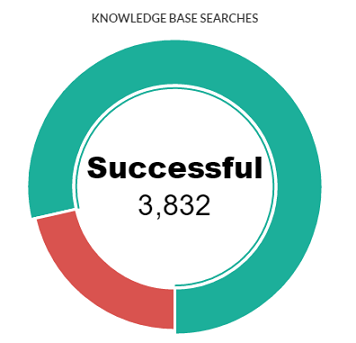 The graphical representation shows the count of successful and failed searches made by users in the knowledge base. Each portion of donut contains a count value corresponding to search type (failed/successful). You can place the mouse pointer on any of the portions to view the number of successful or failed searches made by users respectively. Total Searches: This field displays the total number of searches (successful and failed) made by knowledge base users. Successful Searches: This field displays the total number of successful searches in the knowledge base. Most Popular Search: This field displays name of the most popular keyword or term which is searched by the most number of the users. Failed Searches: This field displays the total number of failed searches made in the knowledge base. Most Failed Search: This field displays the term searched by the most number of users for which no results have been displayed. Recently Successful Search: This field displays the term which has been recently searched by a user and has found successful results. Recently Failed Search: This field displays the term which has been recently searched by a user but has not found any results. 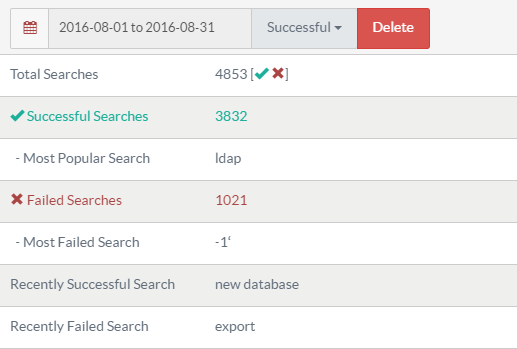 You can delete either successful or failed searches for any desired time period. For this, choose a date/date range from a calendar, select the type of search and then click on Delete button.